Scientific Nature of the Whammy: More Greatness! The wonderful Deb at A Devonshire Design gave me this award for trying to move my life in a positive direction! I just discovered her blog recently (Thanks, SITS! ), and you should go check it out. Thanks, Deb! 4. 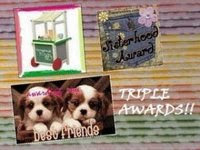 Let them know they have received this award by commenting on their blog. Enz at The 4 Walls. She has been reading this blog and encouraging me from the beginning - let's all support her too! Rachel at Journal of a Non-Dieter, who has also been reading and supporting me. Without their support, and yours, and that of the people at WW, I guarantee you I would not be able to do this. Wow lady, you are doing AWESOME! I am so super proud of you!! I belong to a baby board on Babycenter.com, and all of our babies were born around the same time, some even share birthdays. We are all getting Jillian Michaels (biggest loser trainer) 30 Day Shred DVD and doing it together. I really want to not be such a chunker, and you are motivating me!